This book doesn’t end there, though! After the story, children are invited to meet the real Roxie through a series of pictures and a short story about each. In the final section, there are two adoption guides—one based around helping parents new to adoption, and one for helping therapists new to adoption. Since adoption and foster care is something that my family is considering, the parent’s guide seems like it would be helpful in stressing some of the immediate situations or problems that may occur within a home and offering solutions to them. 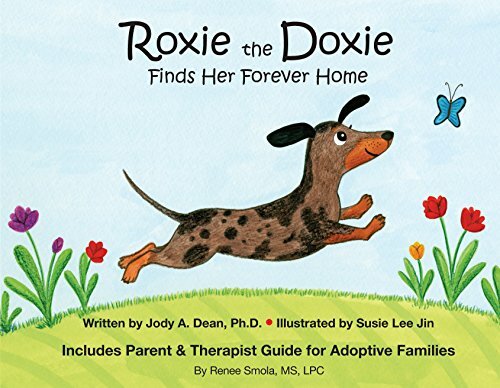 Additionally, the guide offers ways to use “Roxie the Doxie” as a therapy tool for the children who are adopted, as well as the children already in your home. Some of the discussion topics include, “Discuss the similarities and differences in your situation with Roxie’s situation,” and “Talk about how life is different before, during, and after adoption (some may be speculation).” These topics offer powerful methods for helping the children (who may be anxious or hurting) think through their own feelings. The writer reminds the reader that there is no one way to approach a topic and that reading a book like this can be helpful in the short or long term. As mentioned above, there is also a “Therapist Guide to Adoption.” This section seems to include some good help and advice, but since I’m not a therapist, I cannot substantiate its effectiveness. "Roxie the Doxie Finds Her Forever Home" by Jody A. Dean has been an absolute joy in my house. As soon as it arrived, my daughter had to read it. In her own review of the book, she wrote, “I am so excited that I get to keep this book because I want to read about Roxie the Doxie again and again and again.” After reading (and rereading this book), my daughter now seems more at ease with our discussions on adopting other kids into our home.